All transactions are safe and secure with a reliable history in online purchasing behind each of our associates. 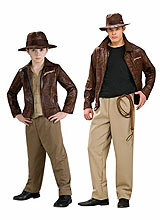 Buy the Indiana Jones Costumes to own Indiana Jones clothing and merchandise. Relive the adventure with one of these timeless Indiana Jones costumes. Styles include the rugged leather jacket look or the more casual khaki button-up. You can even combine the costume with an Indy tee, including the Raiders of the Lost Ark Indiana Jones t-shirt that displays the popular Raiders of the Lost Ark movie poster art. Most fans know that Tom Selleck was originally cast to play Indy. However, due to his contractual commitment to Magnum, P.I. (CBS), he was forced to turn down the role. Steven Spielberg again suggested Harrison Ford and producer George Lucas finally agreed. In addition to the Indiana Jones Costumes above, browse the Indiana Jones Clothing Gallery for more apparel like men's and women's clothes, kids shirts or hoodies.